Egypt, recognizing the influence of the heavens on earth, observed the skies with the utmost attention. The data of astronomy was studied for its meaning: that is to say, the study of correspondences between events in the heavens and events on earth. Astronomy and astrology were, for them, two sides of the same coin. 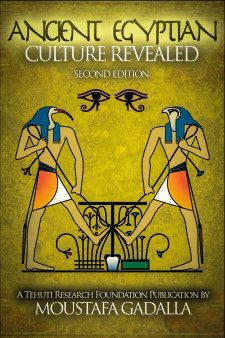 Ancient Egyptian records of all subject matters show a complete coordination and correspondence between Egyptians’ activities on earth and the various cycles of the universe (as some applications are described throughout this book). The Egyptians were very much aware of their dependence on the cycles of earth and sky. Therefore, temple priests were assigned the task of observing the movements of these heavenly bodies. They were also responsible for noting other celestial events and interpreting them. Numerous monuments can be found throughout Ancient Egyptian sites, attesting to their full awareness and knowledge of cosmology and astronomy. Clement Alexandrinus (200 CE) reported about the advanced knowledge of astronomy in Ancient Egypt. He referred to five interrelated volumes in Ancient Egypt on astronomy—one containing a list of the fixed stars, another on the phenomena of the sun and moon, two others on the rising of the stars, and another containing a cosmography and geography, the course of the sun, moon, and the five planets. These references indicate a complete understanding of astronomy unmatched even in our present times. While Western academia attributes the knowledge of astronomy to the Greeks, the Greeks themselves attributed their astronomical knowledge to the Egyptian priests. “The Egyptian priests are supreme in the science of the sky…[the Egyptians]…impart some of their precepts; although they conceal the greater part. [The Egyptians] revealed to the Greeks the secrets of the full year, whom the latter ignored as with many other things”. Astronomers studying Egypt have long argued that Egyptian astronomy was highly advanced; that the precession of the equinoxes was known to them, as was the heliocentric system and many other phenomena supposedly only recently discovered. A few decades ago, those who suggested that astronomy had reached an advanced state long before the invention of the telescope were generally ridiculed or ignored. “Modern” astronomy is attributed to the works of Johannes Kepler [1571–1630 CE], and he is credited with having “discovered” the three planetary laws without the “benefit of a telescope”. Law 1. 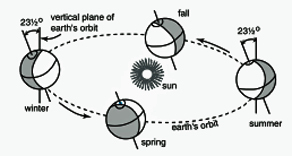 The orbit of a planet/comet about the sun is an ellipse with the sun’s center of mass at one focus. Law 2. A line joining a planet/comet and the sun sweeps out equal areas in equal intervals of time. Law 3. The squares of the periods of the planets are proportional to the cubes of their semi-major axes. “Now, eighteen months after the first light, three months after the true day, but a very few days after the pure Sun of that most wonderful study began to shine, nothing restrains me; it is my pleasure to yield to the inspired frenzy, it is my pleasure to taunt mortal men with the candid acknowledgment that I am stealing the golden vessels of the Egyptians to build a tabernacle to my God from them, far, far away from the boundaries of Egypt”. The jubilant Kepler did not state that he himself discovered anything. Rather, it was all Ancient Egyptian. Numerous monuments can be found throughout Ancient Egyptian sites, attesting to their full awareness and knowledge of cosmology and astronomy. A systematic kind of astronomical observation began in Ancient Egypt at a very early time. 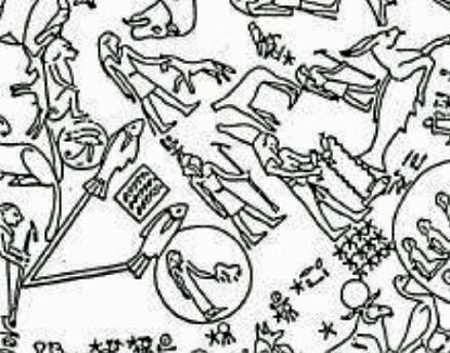 The Ancient Egyptians compiled information, making charts of the constellations based on observations and recordings. A systematic kind of astronomical observation began in very early times. The most ancient astronomical texts presently known are found on the lids of wooden coffins dating from the 9th Dynasty (c. 2150 BCE). These texts are called diagonal calendars or diagonal star clocks, which signify the objectives and contents of these texts: to observe and document the relationship between the stars’ movement and time. The word ‘diagonal’ signifies measurement of angles; i.e., the arc distance of movement during a specific time period. The angular measurements are in conjunction of the Egyptians division of the sky into 36 angular segments. Each has a 10-degrees central angle, for a total of 360 degrees. These texts give the names of the decans (stars which rose at ten-day intervals at the same time as the sun), of which there were 36. More elaborate star charts were found in the New Kingdom (1550–1070 BCE) on the ceiling of the tomb of Senenmut, Queen Hatshepsut’s architect, and on the ceiling at the temple of Abydos. In the tombs of Set I and Ramses IV, VII, and IX, inscriptions that relate to the first and the 16th day of each month give the position occupied by a star at each of the 12 hours of the night in relation to a seated figure (over the left ear, over the right ear, etc.). The Ancient Egyptian knowledge of timekeeping is reflected in their division of the day into 12 hours of day and 12 hours of night. The length of the hour was not fixed, but varied with the seasons. Long days in the summer meant longer hours of the day and the opposite in the winter months. March 21 and September 23, when the sun crosses the equator and day and night are everywhere of equal length, are known as ‘equinoxes’ (equal nights). The variable length of the hour signifies their understanding of the equinox as well as their full understanding of accurate time measurement, as explained below. Because the earth revolves around the sun in the plane of its orbit once each year, the reference line to the sun is changing constantly, and the length of one solar day is not the true time of one rotation of the earth. It is therefore that our “modern” astronomy recognizes that the true time of one rotation of the earth, which is known as the sidereal day, is based on one rotation with respect to the vernal equinox, when the length of day and night are exactly the same. The Ancient Egyptians knew the secrets of time because they observed and studied the apparent motion of the stars, the moon, and the sun. 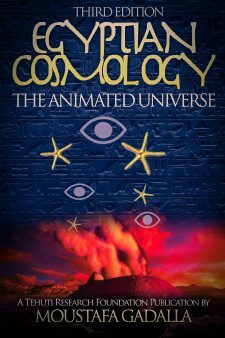 Because all celestial bodies are in constant apparent motion with respect to the observer, it is extremely important to know the precise time of an observation of a celestial body—which the Ancient Egyptians mastered a long time ago. The motion of each celestial body was measured in angular change as a combination of declination and right ascension; these being the given coordinates of the stars on a sky map. The observations were recorded and plotted on a grid by superimposing—under the center of the sky—a human figure sitting upright, with the top of his head placed below the zenith. The grid was typically 8 horizontal segments and 12 vertical segments, representing the 12 hours of the night. The stars which were approaching the zenith were referenced over a portion of this figure, and their position was indicated in the lists of stars: over the left ear, over the right ear, etc. The Ancient Egyptian astronomical texts give the position of the stars during the 12 hours of the night at intervals of 15 days, and from this information, the change in location of a particular point in the sky can be measured. These frequent, regular measurements and recordings led them to correlate the rate of speed of the heavenly bodies and, as such, the Ancient Egyptians were able to record major and minor irregularities in the perceived motion of these celestial bodies. Maps of the heavens and star tables were made in Egypt from a very early date; the stars being grouped together to form constellations like those portrayed on the ceilings of the tomb. Astronomical references to the important constellation of the Bull Leg (Great Bear) to Sirius, to Orion, and to other star groups are found in the Pyramid Texts of the 5th and 6th dynasties. Lists of the decans or ten day stars (or star groups) associated with hour star tables were already in use on the 11th and 12th dynasties’ coffins from Assyut. 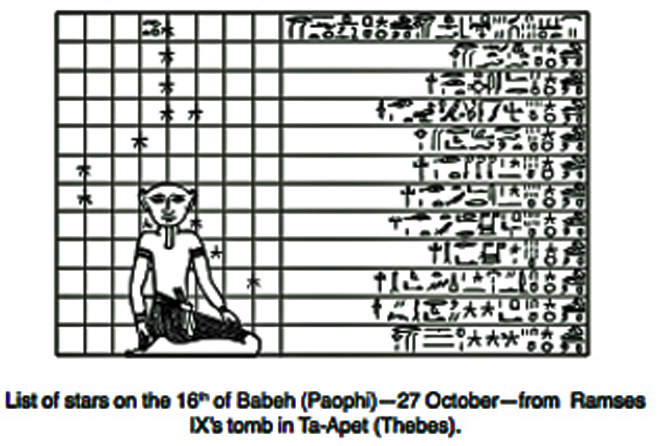 IX’s tomb in Ta-Apet (Thebes). In the case of Ramses IX’s (1131-1112 BCE) tomb, the ceiling shows the positions of the various stars over 12 consecutive 15-day periods. 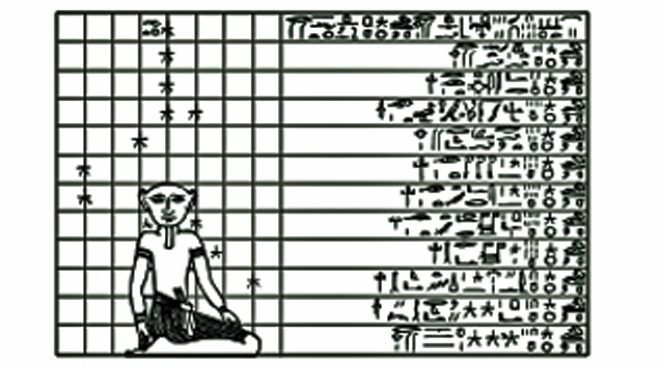 From these star charts, the Ancient Egyptians determined the positions and changes of location and/or time of stars. As such, the Ancient Egyptians were aware of the fact that the stars shifted slowly and that this was easily measurable at meridian transit; and thus the Ancient Egyptians knew and worked out the rate of precessional change. point of finger of the S’ah. 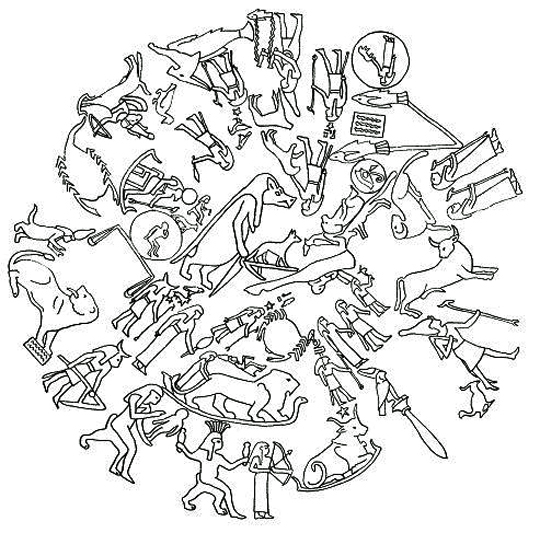 the Ancient Egyptian meaning of the word zodiac—as a circle of animals. These two neteru (gods), they hold, regulate the entire universe, . . . The twin actions of the sun and moon on Earth are the cause of precession. The moon and the sun both tug, gravitationally, on the equatorial bulge of our earth. The moon tries to pull the bulge into the plane of its orbit around the Earth, and the sun tries to pull this bulge into the plane of the Earth’s orbit around the sun. As a result, the Earth does not spin true upon its axis, but more like a slightly off-center spinning top. The combined result of these two tendencies causes the axis of the earth to make a double cone in space, centered on the center of Earth – a sort of wobble. This motion is called precession. The Earth rotates from west to east on its polar axis and revolves about the sun in an elliptical orbit with the sun at one focus of the ellipse. It completes one revolution in a period of 365.2564 days. The inclination of the Earth (23½ degrees with the perpendicular to the orbital plane), combined with its revolution around the sun, causes the lengths of day and night to change and also causes the different seasons [shown above]. There are several components of this wobbly motion of the Earth. They are simply different frequency components of the same physical effects—the tug of war between the three bodies. If the sky is regarded as a constellated backdrop, then because of the wobble of the Earth upon its axis, the vernal equinox each year rises against a gradually shifting background of constellations. The effect is not real, but apparent, and only involves the stars. The stars do not actually move, but appear to move because of the Earth’s precessional wobble. Astronomers call this the precession of the equinoxes. The continuous shifting of the stars’ position acts as a sort of star-clock for our planet. For the Ancient Egyptians, by knowing the exact rate of processional change and the coordinate of a star, they were able to determine its altitude at the meridian for any given time, or its rising point on the eastern horizon. The precession of the equinoxes through the constellations gives names to the twelve zodiac ages. It takes roughly 2,160 years for the equinox to precess through a zodiac sign. 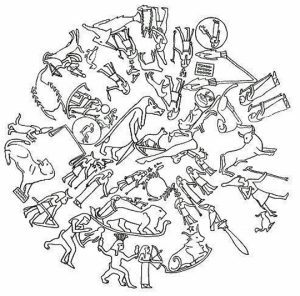 Thus, it takes some 25,920 years for the spring equinox to traverse the full circuit of the constellations of the twelve zodiac signs. This complete cycle is called the Great/Full Year. 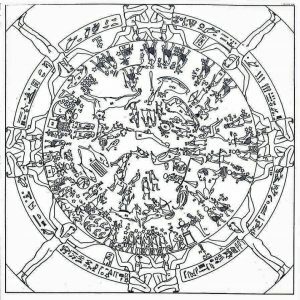 Each of the zodiac ages/signs is divided into three equal segments represented by three human figures in conjunction with the Egyptians dividing the sky into 36 angular segments. Each has a 10-degrees central angle, for a total of 360-degrees. As stated and shown above, these decans are mostly depicted in a linear flow from the earliest period of Egyptian recovered history. Below is the Egyptian zodiac chart showing the major items with less more details than the original chart. The signs of the zodiac are represented in two locations at the Het-Heru (Hathor) Temple at Dendera. It is clearly Ancient Egyptian, with its figures, symbols, etc. The same exact symbolism of depicted zodiac ages, deities, figures, etc. are found in numerous Ancient Egyptian temples and tombs throughout the country, long before the Greco-Roman era. Western academia disregarded the overwhelming physical evidence, as well as the affirmation of Ancient Egyptian sources, that the precession of the equinoxes was known in Egypt since time immemorial. Academia handed the credit to the “Greek” Hipparchus of Alexandria [c.160–125 BCE]. This is yet another pathetic attempt to credit a European with a major achievement. Yet, in this case, Hipparchus (who never claimed himself as the source) could never have single-handedly done something that requires astronomical observations, measurements, and recordings for centuries and millennia.